This Quick Start adds Linux bastion hosts to your new or existing AWS infrastructure for your Linux-based deployments. The bastion hosts provide secure access to Linux instances located in the private and public subnets of your virtual private cloud (VPC). The Quick Start sets up a Multi-AZ environment and deploys Linux bastion host instances into the public subnets to provide readily available administrative access to the environment. You can specify the instance type for the bastion hosts and the number of instances you'd like to deploy (1-4). An Auto Scaling group ensures that the number of bastion host instances always matches the capacity you specify. The Quick Start also sets up Amazon CloudWatch Logs for remote storage of shell history logs, for added security. After you deploy this Quick Start, you can layer your cloud environment with additional AWS services, infrastructure components, and applications to complete your Linux environment in the AWS Cloud. 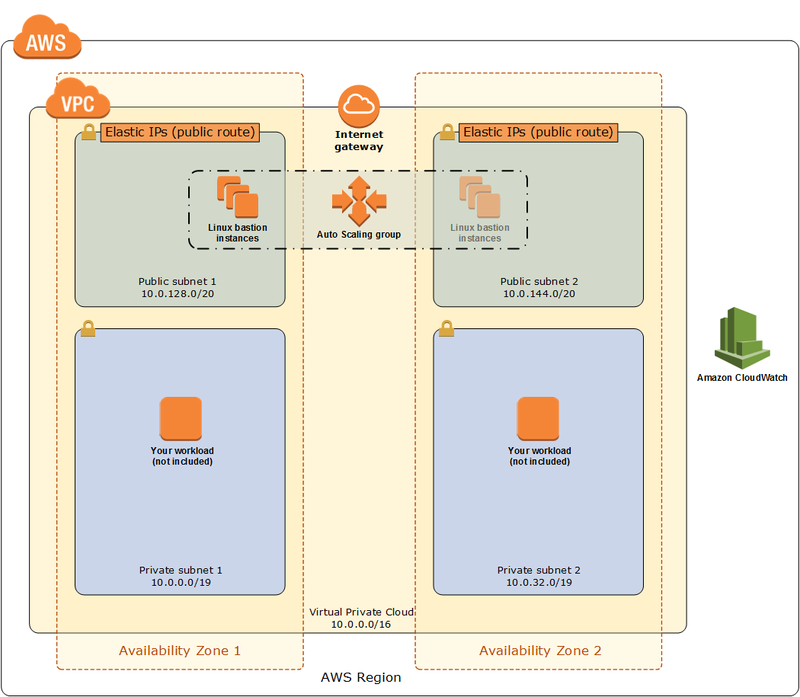 The architecture built by this Quick Start supports AWS best practices for high availability and security. We recommend that you follow the best practices detailed in the deployment guide when you’re using the architecture built by the Quick Start. Add other AWS services or your Linux applications. To customize your deployment, you can change your VPC configuration, choose the number and type of bastion host instances, enable TCP or X11 forwarding, and enable a default or custom banner for your bastion hosts. The AWS CloudFormation template for this Quick Start includes configuration parameters that you can customize. Some of these settings, such as instance type, will affect the cost of deployment. For cost estimates, see the Amazon EC2 pricing page.